Check out a FLIP Kit! Family Literacy Involvement Program (FLIP) is a program for kids birth through age 8 that offers parents resources to enhance family reading time. FLIP Kits are fun, interactive, free, and easy to use. Kits contain everything parents needs to lead their children in literacy-based learning experiences. 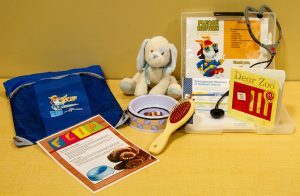 Divided into five age groups, Infant (0-18 months), Toddler (18-36 months), Preschool (3-5 years), Grades K-1, and Grades 2-3, SLPL offers FLIP kits in over 100 titles. Each kit can be checked out for 3 weeks. Browse available FLIP kit titles.